Ushering in BMW’s new-fangled iDrive controller, the Bangle styling and on-board technology was a shock for many. Ushering in BMW’s new-fangled iDrive controller, the Bangle styling and on-board technology was a shock for many. The previous 7 Series was conservative, and never as popular as its rivals, but the daring new one was actually quite a hit as people became used to its distinctive face. Values have been hit hard in recent years though, which means there are some bargains to be had on the used market – presuming you can stomach the potential maintenance bills. Only available as an executive saloon, but offered in standard and long wheelbase variants (+140mm for the latter), the 2003 7 Series ditched the manual option for a sole six-speed automatic. Eleven engines were offered, ranging from the 3.0-litre straight-six petrol unit in the 730i to the 6.0-litre V12 in the 760i. Used values of the smaller petrol models have fallen dramatically, and make an intriguing buy, but it’s the sought after diesel cars that make most sense. There was a choice of the 3-0-litre straight-six in the 730d or 3.9-litre V8 in the 740d. 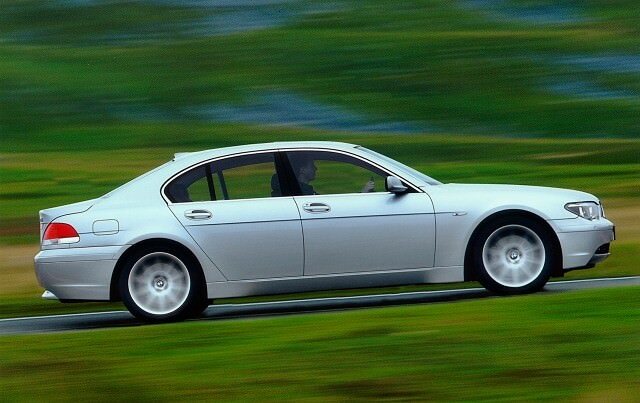 The latter was replaced with the larger 4.4-litre 745d during the 2006 facelift. At this time the petrol engines also received some upgrades, while the cabin and exterior design were refreshed. The controversial iDrive was also updated in a bid to make it more intuitive and user friendly. Buyers had the choice of both standard and SE trim levels, though all 7 Series are well specified. Regardless of how deep your pockets are, it’s the 730d that makes the most sense as a used buy. Sprinting from 0-100km/h in 7.8 seconds the 231hp straight-six engine offered acceptable performance while using 8.2 litres/100km on the combined cycle – the lazy nature of the diesel engine suits the six-speed automatic as well. Either standard or SE trim will be filled with kit, and it’s not worth bothering with the long wheelbase unless you really need the extra room. For those that like to drive, rather than be driven, the 7 Series is a good bet – being far more involving than the Mercedes-Benz S-Class or Audi A8. There’s plenty of space, and the cabin is packed with technology no matter what spec you go for. It’s worth familiarising yourself with the iDrive system before you take the plunge though, as almost all of the car’s systems are controlled by it.